Objectives To estimate the effects of vitamin D supplementation during pregnancy on 11 maternal and 27 neonatal/infant outcomes; to determine frequencies at which trial outcome data were missing, unreported, or inconsistently reported; and to project the potential contributions of registered ongoing or planned trials. Design Systematic review and meta-analysis of randomised controlled trials; systematic review of registered but unpublished trials. Data sources Medline, Embase, PubMed, Cochrane Database of Systematic Reviews, and Cochrane Central Register of Controlled Trials from inception to September 2017; manual searches of reference lists of systematic reviews identified in the electronic search; and online trial registries for unpublished, ongoing, or planned trials. Eligibility criteria for study selection Trials of prenatal vitamin D supplementation with randomised allocation and control groups administered placebo, no vitamin D, or vitamin D ≤600 IU/day (or its equivalent), and published in a peer reviewed journal. Results 43 trials (8406 participants) were eligible for meta-analyses. Median sample size was 133 participants. Vitamin D increased maternal/cord serum concentration of 25-hydroxyvitamin D, but the dose-response effect was weak. Maternal clinical outcomes were rarely ascertained or reported, but available data did not provide evidence of benefits. Overall, vitamin D increased mean birth weight of 58.33 g (95% confidence interval 18.88 g to 97.78 g; 37 comparisons) and reduced the risk of small for gestational age births (risk ratio 0.60, 95% confidence interval 0.40 to 0.90; seven comparisons), but findings were not robust in sensitivity and subgroup analyses. There was no effect on preterm birth (1.0, 0.77 to 1.30; 15 comparisons). There was strong evidence that prenatal vitamin D reduced the risk of offspring wheeze by age 3 years (0.81, 0.67 to 0.98; two comparisons). For most outcomes, meta-analyses included data from a minority of trials. Only eight of 43 trials (19%) had an overall low risk of bias. Thirty five planned/ongoing randomised controlled trials could contribute 12 530 additional participants to future reviews. Conclusions Most trials on prenatal vitamin D published by September 2017 were small and of low quality. The evidence to date seems insufficient to guide clinical or policy recommendations. Future trials should be designed and powered to examine clinical endpoints, including maternal conditions related to pregnancy (such as pre-eclampsia), infant growth, and respiratory outcomes. In 2010, dietary reference intakes for vitamin D for Canada and the US from the Institute of Medicine were based solely on bone health—particularly in young children (for instance, rickets) and older adults (for instance, osteoporosis).1 Considerable skepticism was cast onto the link between vitamin D and extraskeletal health conditions or the potential benefits (versus risks) of intakes larger than the recommended dietary allowance (600 IU/day for most children and adults).1 The institute’s report did not recommend higher intakes during pregnancy and lactation.1 A 2016 update of the Cochrane Collaboration systematic review and meta-analysis of trials of vitamin D in pregnancy (versus placebo or no supplement), however, tentatively concluded that prenatal vitamin D supplementation “may reduce the risk of pre-eclampsia, low birthweight and preterm birth.”6 Other recent systematic reviews that included trials with active control arms (in which participants received vitamin D) acknowledged the potential effect of vitamin D on fetal growth910 but did not find evidence of effects on other maternal, fetal, or infant outcomes.91011 Citing the 2016 Cochrane review,6 the World Health Organization guidelines for antenatal care advise against routine vitamin D supplementation in pregnancy.12 Dietary and supplementation recommendations, however, vary widely across other professional organisations (appendix 1), and there remains a lack of consensus on target health outcomes, indications for prenatal supplementation, or evidence based regimens for supplement dose (or fortification strategies). Given the numerous trials on prenatal vitamin D published since 2015 and the restricted scope of the 2016 Cochrane review, we undertook an updated systematic review of vitamin D in pregnancy to assess the current and future state of the evidence from randomised controlled trials. We specifically aimed to estimate the effects of vitamin D supplementation during pregnancy on maternal, neonatal, and infant outcomes, taking into consideration the quality of available evidence and heterogeneity across studies; determine frequencies at which relevant outcome variable data were missing, unreported, or inconsistently reported among trials that were otherwise eligible for inclusion; and identify ongoing or planned studies of vitamin D supplementation during pregnancy to project the state of evidence that could accrue in the next decade. The protocol was registered (CRD42016051292) and conducted following PRISMA (Preferred Reporting Items for Systematic Reviews and Meta-Analyses) guidelines.13 We sought relevant articles reporting completed studies by searching electronic databases including Medline, Medline in process, Embase, PubMed, the Cochrane Database of Systematic reviews, and the Cochrane Central Register of Controlled Trials (appendix 2) and manual searches of reference lists of any systematic reviews identified in the previous step. Searches were initially done in July 2016 and most recently updated in September 2017. At least one of the articles describing the trial was a full text report published in a scientific journal or in another peer reviewed format. Vitamin D could be given in either form (vitamin D2 or D3), administered at any dose, by any route (oral or intramuscular), and at any frequency—“regular” dosing in which supplementation was offered at least three times in a regular/recurrent manner (such as daily, weekly, monthly) and “bolus” dose regimens in which the supplement was administered only once or twice. Outcome data were not considered in determination of eligibility. There were no language restrictions at the screening stage, but all eligible studies were reported in English. Trials were eligible for inclusion in meta-analysis if all five inclusion criteria were met. Studies that met only the first two inclusion criteria were ineligible for inclusion in meta-analysis but were reviewed separately (that is, trials that had parallel but non-randomised intervention group assignment, trials with control arms administered vitamin D dose >600 IU/day, or those whose results were not reported in a full text publication). We excluded from the systematic review single arm vitamin D trials (such as pharmacokinetic studies); trials in which the intervention was administered only before conception or after delivery; observational cohorts rather than parallel group trials (that is, intervention group assignment was based on review of medical records or participant recall or there was a lack of sufficient evidence in the published report to indicate that participants were assigned prospectively to intervention groups); and trials in which differences in cointervention(s) across trial arms prevented inferences specifically about vitamin D. Two independent reviewers screened abstracts and full text articles for inclusion using a web based systematic review platform (Covidence). Any disagreements at either screening stage were resolved through consensus of at least two reviewers. Two reviewers independently extracted information from eligible studies related to country, baseline characteristics of the study population including 25(OH)D summary data at enrolment, number of participants enrolled, the nature of the supplementation in the intervention and control arms (that is, type of supplementation, dosing regimen, cointerventions, duration), and biochemical and clinical outcomes (appendix 3). For continuous outcomes, we extracted means and corresponding standard deviations in each arm; if trials reported other statistics (such as median and interquartile range), we converted estimates to means and SDs using conventional approaches.14 For binary outcomes, we extracted the number of participants who experienced the event (numerator) and total number of individuals at risk of an observed event (denominator), thereby excluding participants lost to follow-up from the denominator. Unless otherwise specified by the original authors, the number of newborns at risk of any birth related outcome measure (such as preterm birth) was limited to liveborn infants. If available, we used multiple published articles from the same trial population to extract outcome data. We contacted principal investigators or corresponding authors of eligible studies after 1999 for data on outcomes if an outcome was mentioned in published reports but the data were not reported; results for a specified outcome were presented only in qualitative terms (such as “not significant”); or reported data relevant to one of the specified outcomes were labeled or presented with summary measures that could not be incorporated into the meta-analysis. Two reviewers used the Cochrane Collaboration tool for assessing risk of bias to independently assign quality scores to the trials.15 Each study was assessed as having low, high, or unclear risk of bias on seven criteria: random sequence generation, allocation concealment, blinding of participants and personnel, blinding of outcome assessment, incomplete outcome data, selective reporting, and other sources of bias. Any discrepancies between reviewers were resolved through consensus. To enable coherent interpretations of primary meta-analyses related to outcomes that rely on clinical diagnosis or results of diagnostic tests, we specified minimum criteria for case definitions and methods of ascertainment (for instance, routine data collection procedures that were reportedly used to ascribe diagnoses to individual trial participants) (appendix 3). For example, for pre-eclampsia we required evidence that participants were scheduled to undergo routine blood pressure monitoring and urinary protein testing (the latter being undertaken at least among women with hypertension). For gestational diabetes, we required routine glucose challenge testing, oral glucose tolerance test, and/or measurement of HbA1c during follow-up. For biochemical safety events (such as hypercalcaemia), we required that investigators reported a schedule of routine testing of biomarkers in blood/urine. We relaxed case definitions/methods of ascertainment criteria in sensitivity analyses in which we included any trials that mentioned the outcome irrespective of case definitions or methods of ascertainment. We conducted subgroup meta-analyses according to a priori defined sources of potential clinical and methodological heterogeneity17: control arm type (placebo versus vitamin D containing active control); dosing frequency (regular versus bolus); baseline vitamin D status categorised as low (mean 25(OH)D <30 nmol/L) versus sufficient (≥30 nmol/L), based on maternal mean 25(OH)D in the control group at enrolment (“initial baseline”) or at/near delivery (“modified baseline,” which theoretically takes into account the effect of active control supplementation); intervention dose (among regular dose trials), defined as low (<2000 IU/day) versus high (≥2000 IU/day). To facilitate comparisons, regular doses given less frequently than daily were converted to an equivalent daily dose (for example, 28000 IU/week = 4000 IU/day) and expressed as an “effective dose” (that is, intervention dose minus the vitamin D dose in the control group in the same trial). Additional covariates included type of vitamin D supplementation (D2 versus D3); geographical region based on WHO classification (Africa, Americas, South-East Asia, Europe, Eastern Mediterranean, and Western Pacific); and timing of initiation of supplementation (such as first, second, or third trimester) among regular dose trials in which supplementation continued until delivery. For outcomes that included at least 10 eligible intervention arms, we performed meta-regression using the following covariates as continuous independent variables: effective dose, change in maternal 25(OH)D (that is, difference between mean 25(OH)D in intervention and control at/near delivery), initial baseline vitamin D status, and modified baseline status. We conducted sensitivity meta-analyses restricted to trials with recent publication (2000 or later); overall low risk of bias (low risk of bias in all seven criteria); and enrolment of generally healthy women (rather than those with a specific clinical diagnosis). To incorporate trials with zero events in both intervention and control arms (which are automatically dropped from analyses of pooled relative risks), we also did sensitivity analyses for dichotomous outcomes in which we added a “continuity correction” of 0.5 to zero cells.18 Publication bias was assessed by visual inspection of funnel plots for outcomes with at least 10 intervention arms.19 All analyses were conducted with Stata version 13 (College Station, TX). As we could not determine the reasons for missing individual level outcome data across multiple trials, we based all primary meta-analyses on a “complete case analysis” (that is, excluding participants for whom outcomes were missing),20 which implied a missing at random assumption (that is, reasons for missing data were unassociated with the outcome). We considered data imputation methods,2021 but available approaches require untenable or unverifiable assumptions and serve only to explore the potential change in pooled effect sizes given a departure from missing at random rather than provide more reliable estimates of effects. Therefore, we chose to contextualise the primary findings in a critical assessment of missingness for each outcome by calculating the number/proportion of all participants enrolled in each trial for whom the outcome was missing because the outcome was not reportedly assessed in any participants during the trial; unreported because of loss of follow-up or incomplete reporting of planned trial outcomes; or reported by authors but in a manner that prevented inclusion of the data in the meta-analysis. Missingness analyses were based only on the trials eligible for inclusion in meta-analyses. We searched seven clinical trial registries (WHO, Clinicaltrials.gov, ISRCTN, ANZCTR, DRKS, EU-CTR, IRCT) to identify ongoing or planned clinical trials worldwide (appendix 4). Studies were considered eligible if they had not published results; had enrolled participants no earlier than 2009; and were considered likely to meet the criteria for inclusion in meta-analyses based on available information. We excluded duplicate trials within and between registries (identified by trial ID, title, investigators, sample sizes). We screened titles and registry pages for eligibility and verified that results of eligible trials had not been published in peer reviewed journals before September 2017. All screening stages were done in duplicate by two independent reviewers, and discrepancies were resolved through discussion among two or more reviewers. From registry entries of eligible ongoing/planned trials, we extracted information (when available) on geographical location, study status (for example, completed but unpublished, ongoing, not yet started, status unknown), number of participants enrolled, recruitment start date, inclusion and exclusion criteria, details on vitamin D supplementation dose, frequency and duration, cointerventions, and primary and secondary outcomes that investigators listed in the registry. Studies were classified as being likely to contribute published results by 2020 (that is, studies for which at least enrolment has been completed) or 2024 (studies for which enrolment is ongoing, not yet started, or for which the status is unknown). We assessed the potential contribution of eligible planned/ongoing prenatal vitamin D trials by identifying the number of participants and trials for the same prespecified list of maternal or child outcomes as in the systematic review of completed trials. 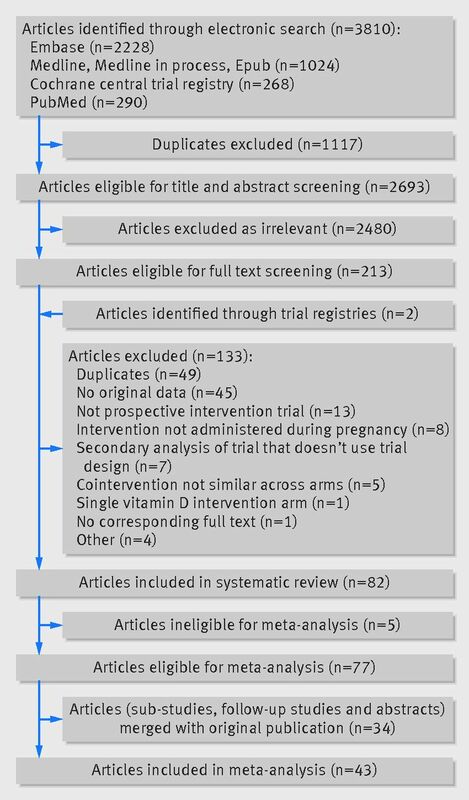 Among 3810 articles identified from the literature search, 43 prenatal vitamin D trials were eligible for inclusion in meta-analyses based on data in 77 publications (fig 1⇓; table A in appendix 5). We received responses from 10 of 16 (63%) authors of studies we contacted for further data on outcomes that were either missing (but presumed to have been collected based on published trials methods) or reported in qualitative terms or a format that could not be incorporated into a meta-analysis (appendix 6). Five trials met the broadest two criteria for inclusion in the systematic review but were ineligible for inclusion in meta-analyses (appendix 7). The 43 eligible trials comprised 55 intervention-control arm comparisons and a total of 8406 enrolled women (table 1⇓; tables A and B in appendix 5). 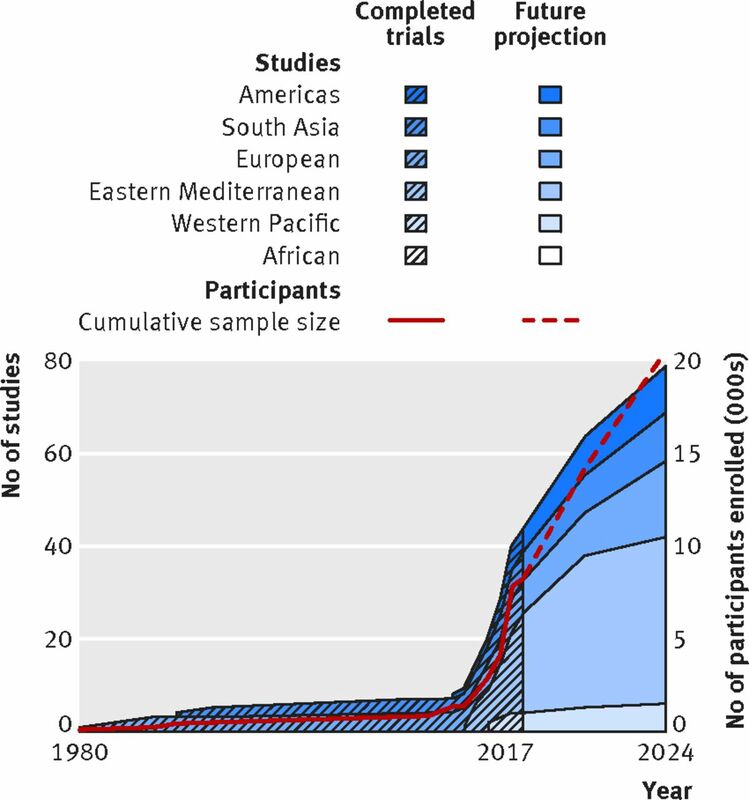 Most trials were conducted in 2000 or later (88%), with an acceleration in the publication rate after about 2010, particularly in the Eastern Mediterranean region (fig 2⇓). Few trials in South Asia were published recently, and there were no trials in Africa (table 1⇓; fig 2⇓). For most outcomes, meta-analyses included data from a minority of the trials, and two trials did not contribute to any meta-analyses (appendix 8). Several trials mentioned outcomes in a manner that did not meet minimum criteria for case defintition and/or methods of ascertainment and were thus included only in sensitivity analyses (table C in appendix 5). There was substantial clinical and methodological heterogeneity between trials (table 1⇓), including wide variation in baseline maternal vitamin D status (fig 3⇓; table B in appendix 5). 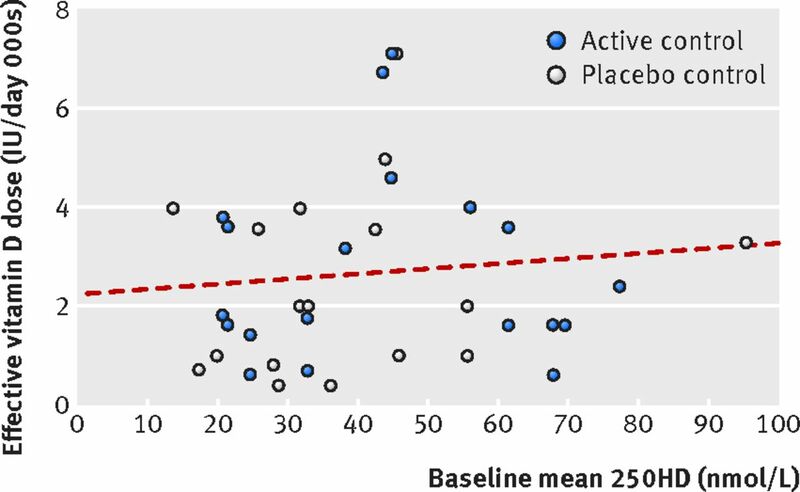 Among regular dose trials, effective doses were no higher in populations with lower baseline vitamin D status, and placebo controlled trials did not consistently use higher effective doses nor were they more likely to be conducted in populations deficient in vitamin D compared with active control trials (fig 3⇓). Only eight of 43 trials (19%) had an overall low risk of bias (appendix 9). We performed meta-analyses for 11 maternal and 27 neonatal/infant outcomes (tables 2 and 3⇓). The most widely reported outcome was mean maternal 25(OH)D concentration at or near delivery, and data on cord 25(OH)D concentration were also often available (table 3⇓; appendix 7). Overall, intervention groups attained significantly higher maternal and cord 25(OH)D concentrations than the control groups (table 3⇓). Higher regular dose regimens (≥2000 IU/day) led to a greater average increment in maternal delivery and cord 25(OH)D than lower doses (tables S1 and S2 in appendix 10); however, the linear dose-response curves for maternal and cord blood indicated modest effects of increasing vitamin D doses on the increment in 25(OH)D concentrations (fig S2 and S4 in appendix 10). The 25(OH)D response to supplemental vitamin D was not enhanced in trial populations with low mean baseline 25(OH)D (<30 nmol/L) (tables S1 and S2 in appendix 10). Maternal clinical outcomes were reported in only a few small trials (table 2⇑; tables S3-S12 and figs S5-S26 in appendix 10). Pooled effect estimates therefore had wide confidence intervals except for caesarean section (for which there was evidence of no effect of vitamin D), and 95% confidence intervals for all primary pooled estimates for maternal clinical outcomes except hypocalcaemia included the null (table 2⇑). Numerous trials mentioned pre-eclampsia, gestational hypertension, or gestational diabetes in a manner that did not meet our minimum criteria for case definitions and methods of ascertainment (tables S3-S5 in appendix 10). Inclusion of all trials irrespective of these criteria, however, suggested that vitamin D could reduce the risk of gestational diabetes (risk ratio 0.61, 95% confidence interval 0.45 to 0.83; 14 comparisons; 2643 participants) (table S5 and fig S10 in appendix 10). In contrast, ignoring these criteria did not change inferences with respect to pre-eclampsia (0.82, 0.63 to 1.07; 16 comparisons; 3398 participants) or gestational hypertension (0.83, 0.53 to 1.30; 8 comparisons; 2430 participants) (tables S3-S4 and fig S6 and S8 in appendix 10). Biochemical safety outcomes (hypercalcaemia, hypercalciuria, hypocalcaemia) were rare; only four trials met our minimum criteria for case definitions and methods of ascertainment based on routine monitoring of maternal serum calcium (table 2⇑; tables S9-S11in appendix 10), yet ignoring the these criteria did not change the inference that there was no significant effect of vitamin D supplementation on the risk of hypercalcaemia, which is a primary indicator of toxicity of vitamin D supplementation (table S9 and fig S18 in appendix 10). Birth anthropometry and preterm birth were among the most commonly reported outcomes (tables 2 and 3⇓). Pooling of 37 comparisons indicated that prenatal vitamin D supplementation (versus low dose, no vitamin D, or placebo) increased mean birth weight by an average of 58 g (fig 4⇓). In a cumulative meta-analysis, 95% confidence intervals have excluded the null since 2013, but the magnitude of the effect on birth weight attenuated over the most recent few years (fig 4⇓). The magnitude of the pooled effect remained relatively stable in sensitivity analyses (table S13 in appendix 10) and was unaffected by the removal of single outlier trials (not shown). There was significant heterogeneity between trials that might have been partly explained by the greater effects on birth weight in groups that received bolus doses of vitamin D3 and in trials that were conducted in South Asia (table S13 in appendix 10). Furthermore, there was no significant dose-response effect or inverse relation with baseline 25(OH)D (fig S28 in appendix 10). In a post hoc analysis of the effect on birth weight that took into account both effective dose and baseline vitamin D status, there was a significant dose-response effect in trials in which mean baseline 25(OH)D was 30-50 nmol/L but no association in trials with mean 25(OH)D <30 nmol/L (fig S29 in appendix 10). Consistent with the pooled effect on mean birth weight—but in a smaller subset of only seven comparisons—vitamin D reduced the risk of small for gestational age (SGA) (table 2⇑; table S14 and fig S30 in appendix 10). Although there was little heterogeneity across trials and a lack of notable subgroup effects, none of the studies that reported data on small for gestational age had an overall low risk of bias (table S14 in appendix 10). The available evidence did not indicate a significant effect on other indicators of fetal growth, including low birth weight, birth length, or birth head circumference (table 3⇑; tables S15-S17 and figs S31-S36 in appendix 10). There was no apparent effect of vitamin D on gestational age at birth (table 3⇑; table S18 and figs S37-S38 in appendix 10) or the risk of preterm birth (table 2⇑; table S19 and figs S39-S41 in appendix 10). Clinical events in newborns (congenital anomalies, admission to neonatal care unit, death) as well as neonatal hypocalcaemia or hypercalcaemia were infrequently and inconsistently reported (table 2⇑; tables S20-S24 and figs S42-S50 in appendix 10). Infant clinical or functional outcomes beyond the newborn period were also rarely reported. The pooled estimate from two high quality regular dose trials in high income countries (total 1387 participants) indicated that prenatal vitamin D supplementation significantly decreased the risk of persistent/recurrent wheeze in offspring by age 3 years (table 2⇑; fig S51 in appendix 10). This inference remained unchanged on inclusion of three other trials for which asthma/wheeze outcomes did not meet our minimum criteria for case definitions and methods of ascertainment (table S25 and fig S52 in appendix 10). There were no significant effects on the risk of infant acute respiratory infections overall, risk of ever having an upper respiratory infection, or the risk of ever having a lower respiratory infections (table 2⇑; tables S26-S28 and figs S53-S55 in appendix 10). Two studies reported effects on neonatal bone mineral content and bone mineral density, for which the meta-analysis did not support an effect of vitamin D (table 3⇑; tables S29-S30 and figs S56-S57 in appendix 10). One trial (two comparisons) found that bone mineral content and density at 12-16 months of age were lower in the vitamin D groups than in placebo groups (table 3⇑; tables S31-S32 and figs S58-S59 in appendix 10). Two trials in which infant anthropometry was reported with raw measures showed an increase in length at age 1 year, but the overall effect on mean length for age z score in two studies (three comparisons) was not significant (table 3⇑; tables S33 and S36 and figs S60 and S63 in appendix 10). There were no significant pooled effects on other anthropometric measures in infancy (table 3⇑; tables S34-S35 and S37-S38 and figs S61-S62 and S64-S65 in appendix 10). Maternal and cord 25(OH)D at delivery, stillbirth, preterm birth, and birth weight/length/head circumference were the only outcomes reported for more than half of enrolled participants (fig 5⇓; appendix 6). As most women were enrolled in trials that apparently did not implement surveillance for other clinical outcomes, outcome data were often unavailable (fig 5⇓). 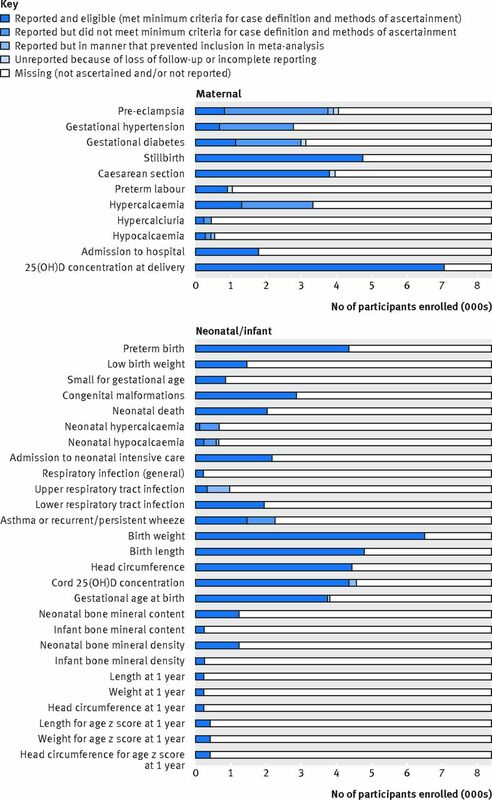 For some maternal outcomes (such as pre-eclampsia, hypertension, gestational diabetes, maternal hypercalcaemia), a substantial number of participants were enrolled in trials in which such outcomes were mentioned but could not be included in the primary meta-analyses because they did not meet a minimum set of criteria for case definitions and methods of ascertainment (fig 5⇓; table C in appendix 5). A relatively small minority of participants were excluded because of loss to follow-up or because outcomes were reported but in a manner that could not be technically included in the meta-analysis (fig 5⇓). We identified 35 registered trials of prenatal vitamin D with a total target enrolment of 12 530 participants, of which 19 (54%) were completed but unpublished, 11 (31%) were ongoing or planned, and five (14%) had indeterminate status (fig 2⇑; table A and fig A in appendix 11). Of the 35 registered trials, 22 (63%) have either a non-intervention or placebo control group and most (74%) involve regular dosing regimens ranging from 400 IU/day to 4000 IU/day. Among trials with bolus regimens, doses varied from 400 IU to 300 000 IU. Nearly half of the trials (40%) are in the Eastern Mediterranean, of which 10 are in Iran. Most (57%) are in low or middle income countries, including Bangladesh, India, Pakistan, Mongolia, and Tanzania. The largest trial involves 2300 HIV positive women in Tanzania (NCT02305927), with the primary outcomes of maternal progression of HIV, small for gestational age, and stunting in infancy. The second largest trial, involving 1300 women in Bangladesh (NCT01924013), was designed to assess effects on infant mean length for age z score at one year, with a substudy focused on the effects on infant viral acute respiratoy infections in the first six months of life (NCT02388516). The third largest trial, involving 1000 women in Sweden (2010-019483-37), has numerous outcomes including pre-eclampsia, preterm labour, preterm birth, low birth weight, and stillbirth. Similar to published trials, most of the ongoing/planned trials do not seem to have been designed to generate inferences related to clinical outcomes. The most common trial outcomes will be maternal 25(OH)D at delivery, cord 25(OH)D, and hypertensive diseases (table B in appendix 11). Optimistic projections indicate that 15 trials (6610 participants) will contribute data related to hypertensive disorders (pre-eclampsia and gestational hypertension) (table B in appendix 11), but detailed criteria for case definitions and methods of ascertainment were rarely described in registry entries. Only two trials (1740 participants) will report infant acute respiratoy infection outcomes. No registered trials indicated neonatal/infant mortality or rickets as outcomes. Though trials of prenatal vitamin D supplementation are being published at an accelerating pace, randomised controlled trials published up to 2017 were generally small, low quality, and rarely designed to examine clinical outcomes. Although data could be statistically pooled for several outcomes, irreconcilable heterogeneity between trials (such as variable baseline vitamin D status) rendered most inferences difficult to interpret or apply. Moreover, missing data on clinical outcomes was the norm rather than exception, leading to potentially biased meta-analyses based on small non-representative subsets of trials and participants. Though some observational studies have shown associations between maternal vitamin D deficiency and gestational diabetes and pre-eclampsia,22 we did not find robust corroborating evidence from randomised controlled trials. Few trials, however, deliberately measured maternal conditions related to pregnancy or adverse events. Most trials reported mean birth weight, providing a wide distribution of estimates surrounding the pooled effect of +58 g in the vitamin D groups. This could be evidence of the biological responsiveness of fetal growth to vitamin D, consistent with observational epidemiological studies2223 and some animal research.2425 Yet this is also an example of an intangible meta-analysis result that frustrates as much as it illuminates as the effect cannot be attributed to a specific dose or target 25(OH)D threshold. No large single trial produced the effect size and inference implied by the meta-analysis, and subgroup analyses and meta-regression mostly weakened the inference. Moreover, there were no significant effects on other neonatal anthropometric variables. Two trials indicated that vitamin D could enhance postnatal linear growth, an outcome related to growth plates for which a hypothesised role of vitamin D is logical,26 and which is the primary focus of our as yet unpublished trial in Bangladesh.27 In the few studies reporting effects on infant bone mass, results were mixed; the largest of these trials—the MAVIDOS study in the UK, which excluded women with 25(OH)D concentrations <25 nmol/L28—has scheduled follow-up of children at age 4 years.29 Infant rickets was not reported in any trials; though rare, this is one of the most likely paediatric conditions to be directly caused by poor maternal and early infant vitamin D status.30 Adverse events were infrequently reported, resulting in unreliable meta-analyses. For example, prenatal vitamin D supplementation in deficient women modifies neonatal calcium homeostasis,31 but clinical correlates (such as symptomatic infant hypocalcaemia) were rare and infrequently ascertained across trials. Nonetheless, there was no evidence of any specific harms to mothers or fetuses attributable to vitamin D supplementation within the range of reported doses. 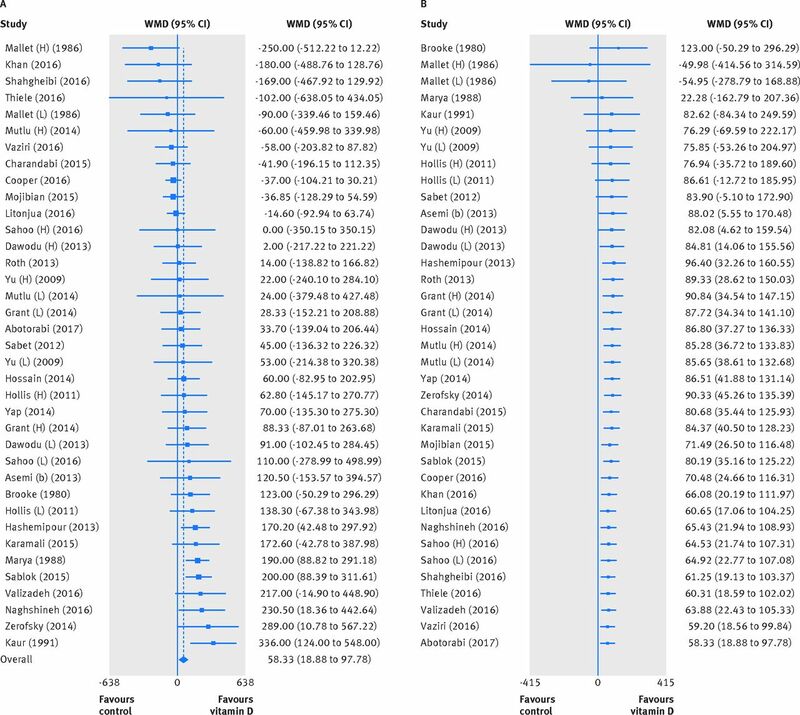 One of the most robust findings in our systematic review—which has been previously reported32—was the beneficial effect of prenatal vitamin D on risk of persistent/recurrent wheeze (or asthma) in offspring, based on data from two large well conducted trials in which wheeze/asthma was the primary outcome.3334 This is broadly consistent with the possibly positive effect of vitamin D on severity of illness in adults with asthma.5 Before prenatal vitamin D can be recommended as a routine preventive measure against childhood asthma, however, further work is required to clarify the minimum effective dose and longer term follow-up to determine if observed early effects on symptoms translate into reductions in the incidence of asthma and improvements in pulmonary function. Meta-regression or subgroup analyses can theoretically illustrate dose-responsiveness, thereby more precisely guide supplement dosing. The interpretation of micronutrient intervention trials, however, is complex because all individuals have some vitamin D intake or endogenous production.35 The effect of a given dose depends on the difference between the intervention and control doses (or the difference in mean 25(OH)D in the intervention versus control group at/near delivery) as well as baseline vitamin D status. Populations without vitamin D deficiency might have little to gain from any dose, but deficient populations might require relatively high doses to raise vitamin D status to an optimal range associated with clinical benefits.35 In this framework, the distinction between placebo versus active control trials is only informative insofar as an active control dose increases the baseline status to which the intervention dose is compared (as such, we considered a “modified” baseline status to be reflected by the mean 25(OH)D at delivery in the control group). If a modest dose of vitamin D (<600 IU/day) readily eliminates deficiency in even the most deficient women, then we might expect to see benefits only in placebo control trials conducted in populations where deficiency is common. Overall, the present findings did not adhere to these expected or plausible dose-response patterns; specifically, we did not consistently find greater effects at higher effective doses, when there were larger differences in maternal 25(OH)D at delivery, in relatively deficient populations (based on either initial or modified baseline), or in placebo controlled trials. Many of the reported doses, however, did not yield effects on maternal 25(OH)D that would be expected based on vitamin D pharmacokinetics.3637 The muted dose-25(OH)D relation could be attributed to high baseline 25(OH)D, low precision of 25(OH)D assays, low rates of adherence to supplementation regimens, or lower than labeled vitamin D content of the supplements. We considered the weak association between dose and 25(OH)D to reflect the overall low quality of many of the trials, which tempered expectations of finding dose dependent effects of vitamin D on clinical outcomes. Compared with the 2016 Cochrane review by De-Regil and colleagues,6 we included all nine trials that were included in the Cochrane review, 10 trials that were published before June 2015 (when the Cochrane literature search was last updated) but considered ineligible for the Cochrane review (four of which were placebo controlled), three trials published before June 2015 that were not identified in the Cochrane search but would likely have been eligible, and 21 trials published since June 2015. Yet, discrepancies in results between the two systematic reviews were not solely attributable to study inclusion criteria. For example, for the effect of vitamin D on pre-eclampsia, De-Regil and colleagues reported a pooled risk ratio of 0.52 (95% confidence interval 0.25 to 1.05) based on two trials that we included in our review, but neither of which met our minimum criteria for case definitions and methods of ascertainment: one trial only mentioned the exclusion of a participant for “severe pre-eclampsia,”38 and the other reported frequencies of pre-eclampsia but did not mention any screening or diagnostic procedures.39 De-Regil and colleagues also reported that vitamin D reduced the risk of preterm birth based on thee trials,6 but the current meta-analysis based on 15 comparisons produced reasonably strong evidence of a null effect. These discrepancies highlight well known concerns about the inherent methodological pitfalls of meta-analysis40 and the inconsistencies and conflicting results across many published systematic reviews.4142 Although we preregistered this review, followed standard guidelines, and carefully considered heterogeneity and missing data, the selection of studies and outcome data and our choices of analytical approaches were unavoidably subjective and thus prone to bias. We contacted authors to clarify some outcome data to enable its inclusion in the meta-analysis but did not expect authors to do time consuming new analyses (such as incidence rates for acute respiratory infection). A narrative review of findings of five vitamin D trials that were considered ineligible did not materially alter any of the inferences from the meta-analyses, suggesting that our conclusions were not biased by overly stringent inclusion criteria. It is possible that more robust findings would result from individual participant data meta-analyses, but this would not rectify the problem of low quality trial methods and scant data related to key clinical outcomes (such as pre-eclampsia). John Ioannidis recently remarked that “systematic reviews may sometimes be most helpful if, instead of focusing on the summary of the evidence, highlight the biases that are involved and what needs to be done to remedy the state-of-the-evidence in the given field.”46 We conclude that there is currently insufficient evidence to guide recommendations for prenatal vitamin D supplementation. Cautious projections for the next decade suggest that we will eventually know more about vitamin D in pregnancy than we do now, but in the absence of a coordinated effort and funding to conduct large new trials, some of the most critical questions about the effectiveness of prenatal vitamin D supplementation will probably remain unanswered in the foreseeable future. We thank the following authors who generously provided summary statistics or clarifications about their published findings: Sima Hashemipour (Qazvin University of Medical Science, Qazvin, Iran); Aanchal Sablok (Vardhman Mahavir Medical College, New Dehli, India); Bruce Hollis, Carol Wagner, and Myla Ebeling (Medical University of South Carolina, Charleston, US); Christine Rodda (University of Melbourne, Victoria, Australia) and Amanda Vincent (Monash University, Victoria, Australia); Nazli Hossain (Dow University of Health Sciences, Karachi, Pakistan); Mojgan Mirghafourvand (Tabriz University of Medical Sciences, Tabriz, Iran); Adekunle Dawodu (Cincinnati Children’s Hospital Medical Center, Cincinnati, US); Cyrus Cooper and Rebecca Moon (University of Southampton, Southampton, UK); Cameron Grant (University of Auckland, Auckland, New Zealand). Contributors: DER and EM designed the study and wrote the protocol. ML and EM selected articles and performed the assessment of bias. HQ and JW identified registered trials. ML, EM, HQ, JW, and EP extracted data. ML performed the statistical analysis. DER supervised study activities and wrote the first draft of the manuscript. All authors critically reviewed and revised the manuscript and approved the final version for publication. DER is guarantor. Funding: This work was supported by the Hospital for Sick Children through support to DER. Data sharing: The dataset is available from the lead author on request. Ross AC, Taylor CL, Yaktine AL, Del Valle HB. Committee to Review Dietary Reference Intakes for Vitamin D and Calcium, Institute of Medicine. Dietary Reference Intakes for Calcium and Vitamin D.The National Academies Press, 2010. Zhang R, Li B, Gao X, et al. Serum 25-hydroxyvitamin D and the risk of cardiovascular disease: dose-response meta-analysis of prospective studies. Am J Clin Nutr2017;359:810-9. doi:10.3945/ajcn.116.140392 pmid:28251933. Keum N, Giovannucci E. Vitamin D supplements and cancer incidence and mortality: a meta-analysis. Br J Cancer2014;359:976-80. doi:10.1038/bjc.2014.294 pmid:24918818. Martineau AR, Jolliffe DA, Hooper RL, et al. Vitamin D supplementation to prevent acute respiratory tract infections: systematic review and meta-analysis of individual participant data. BMJ2017;359:i6583. doi:10.1136/bmj.i6583 pmid:28202713. Martineau AR, Cates CJ, Urashima M, et al. Vitamin D for the management of asthma. Cochrane Database Syst Rev2016;359:CD011511.pmid:27595415. De-Regil LM, Palacios C, Lombardo LK, Peña-Rosas JP. Vitamin D supplementation for women during pregnancy. Cochrane Database Syst Rev2016;359:CD008873.pmid:26765344. Palacios C, Gonzalez L. Is vitamin D deficiency a major global public health problem?J Steroid Biochem Mol Biol2014;359(Pt A):138-45. doi:10.1016/j.jsbmb.2013.11.003 pmid:24239505. Seamans KM, Cashman KD. Existing and potentially novel functional markers of vitamin D status: a systematic review. Am J Clin Nutr2009;359:1997S-2008S. doi:10.3945/ajcn.2009.27230D pmid:19403634. Pérez-López FR, Pasupuleti V, Mezones-Holguin E, et al. Effect of vitamin D supplementation during pregnancy on maternal and neonatal outcomes: a systematic review and meta-analysis of randomized controlled trials. Fertil Steril2015;359:1278-88.e4. doi:10.1016/j.fertnstert.2015.02.019 pmid:25813278. Thorne-Lyman A, Fawzi WW. Vitamin D during pregnancy and maternal, neonatal and infant health outcomes: a systematic review and meta-analysis. Paediatr Perinat Epidemiol2012;359(Suppl 1):75-90. doi:10.1111/j.1365-3016.2012.01283.x pmid:22742603. Harvey NC, Holroyd C, Ntani G, et al. Vitamin D supplementation in pregnancy: a systematic review. Health Technol Assess2014;359:1-190. doi:10.3310/hta18450 pmid:25025896. World Health Organization. Recommendations on Antenatal Care for a Positive Pregnancy Experience. WHO, 2016. http://www.who.int/reproductivehealth/publications/maternal_perinatal_health/anc-positive-pregnancy-experience/en/. Moher D, Liberati A, Tetzlaff J, Altman DG. PRISMA Group. Preferred reporting items for systematic reviews and meta-analyses: the PRISMA statement. Ann Intern Med2009;359:264-9, W64. doi:10.7326/0003-4819-151-4-200908180-00135 pmid:19622511. Higgins JPT, Green S. Cochrane Handbook for Systematic Reviews of Interventions Version 5.1.0 [updated March 2011]: The Cochrane Collaboration; 2011. http://www.handbook.cochrane.org/. Higgins JP, Altman DG, Gøtzsche PC, et al. Cochrane Bias Methods Group Cochrane Statistical Methods Group. The Cochrane Collaboration’s tool for assessing risk of bias in randomised trials. BMJ2011;359:d5928. doi:10.1136/bmj.d5928 pmid:22008217. Higgins JP, Thompson SG. Quantifying heterogeneity in a meta-analysis. Stat Med2002;359:1539-58. doi:10.1002/sim.1186 pmid:12111919. Gagnier JJ, Moher D, Boon H, Beyene J, Bombardier C. Investigating clinical heterogeneity in systematic reviews: a methodologic review of guidance in the literature. BMC Med Res Methodol2012;359:111. doi:10.1186/1471-2288-12-111 pmid:22846171. Friedrich JO, Adhikari NK, Beyene J. Inclusion of zero total event trials in meta-analyses maintains analytic consistency and incorporates all available data. BMC Med Res Methodol2007;359:5. doi:10.1186/1471-2288-7-5 pmid:17244367. Higgins JPT, Green S. Cochrane Collaboration. Cochrane handbook for systematic reviews of interventions. Wiley-Blackwell, 2008. Akl EA, Kahale LA, Agoritsas T, et al. Handling trial participants with missing outcome data when conducting a meta-analysis: a systematic survey of proposed approaches. Syst Rev2015;359:98. doi:10.1186/s13643-015-0083-6 pmid:26202162. Mavridis D, Chaimani A, Efthimiou O, Leucht S, Salanti G. Addressing missing outcome data in meta-analysis. Evid Based Ment Health2014;359:85-9. doi:10.1136/eb-2014-101900 pmid:25009175. Aghajafari F, Nagulesapillai T, Ronksley PE, Tough SC, O’Beirne M, Rabi DM. Association between maternal serum 25-hydroxyvitamin D level and pregnancy and neonatal outcomes: systematic review and meta-analysis of observational studies. BMJ2013;359:f1169. doi:10.1136/bmj.f1169 pmid:23533188. Eckhardt CL, Gernand AD, Roth DE, Bodnar LM. Maternal vitamin D status and infant anthropometry in a US multi-centre cohort study. Ann Hum Biol2015;359:217-24. doi:10.3109/03014460.2014.954616 pmid:25268792. Finch SL, Rauch F, Weiler HA. Postnatal vitamin D supplementation following maternal dietary vitamin D deficiency does not affect bone mass in weanling guinea pigs. J Nutr2010;359:1574-81. doi:10.3945/jn.109.113977 pmid:20660278. Rummens K, van Bree R, Van Herck E, et al. Vitamin D deficiency in guinea pigs: exacerbation of bone phenotype during pregnancy and disturbed fetal mineralization, with recovery by 1,25(OH)2D3 infusion or dietary calcium-phosphate supplementation. Calcif Tissue Int2002;359:364-75. doi:10.1007/s00223-001-2125-4 pmid:12196905. Bell TD, Demay MB, Burnett-Bowie SA. The biology and pathology of vitamin D control in bone. J Cell Biochem2010;359:7-13. doi:10.1002/jcb.22661 pmid:20506379. Roth DE, Gernand AD, Morris SK, et al. Maternal vitamin D supplementation during pregnancy and lactation to promote infant growth in Dhaka, Bangladesh (MDIG trial): study protocol for a randomized controlled trial. Trials2015;359:300. doi:10.1186/s13063-015-0825-8 pmid:26169781.
Cooper C, Harvey NC, Bishop NJ, et al. MAVIDOS Study Group. Maternal gestational vitamin D supplementation and offspring bone health (MAVIDOS): a multicentre, double-blind, randomised placebo-controlled trial. Lancet Diabetes Endocrinol2016;359:393-402. doi:10.1016/S2213-8587(16)00044-9 pmid:26944421. Harvey NC, Javaid K, Bishop N, et al. MAVIDOS Study Group. MAVIDOS Maternal Vitamin D Osteoporosis Study: study protocol for a randomized controlled trial. Trials2012;359:13. doi:10.1186/1745-6215-13-13 pmid:22314083. Munns CF, Shaw N, Kiely M, et al. Global Consensus Recommendations on Prevention and Management of Nutritional Rickets. J Clin Endocrinol Metab2016;359:394-415. doi:10.1210/jc.2015-2175 pmid:26745253. Harrington J, Perumal N, Al Mahmud A, Baqui A, Roth DE. Vitamin D and fetal-neonatal calcium homeostasis: findings from a randomized controlled trial of high-dose antenatal vitamin D supplementation. Pediatr Res2014;359:302-9. doi:10.1038/pr.2014.83 pmid:24937546. Vahdaninia M, Mackenzie H, Helps S, Dean T. Prenatal Intake of Vitamins and Allergic Outcomes in the Offspring: A Systematic Review and Meta-Analysis. J Allergy Clin Immunol Pract2017;359:771-778.e5. doi:10.1016/j.jaip.2016.09.024 pmid:27888033. Litonjua AA, Carey VJ, Laranjo N, et al. Effect of Prenatal Supplementation With Vitamin D on Asthma or Recurrent Wheezing in Offspring by Age 3 Years: The VDAART Randomized Clinical Trial. JAMA2016;359:362-70. doi:10.1001/jama.2015.18589 pmid:26813209. Chawes BL, Bønnelykke K, Stokholm J, et al. Effect of vitamin d3 supplementation during pregnancy on risk of persistent wheeze in the offspring: A randomized clinical trial. JAMA2016;359:353-61. doi:10.1001/jama.2015.18318 pmid:26813208. Lappe JM, Heaney RP. Why randomized controlled trials of calcium and vitamin D sometimes fail. Dermatoendocrinol2012;359:95-100. doi:10.4161/derm.19833 pmid:22928064. Aloia JF, Patel M, Dimaano R, et al. Vitamin D intake to attain a desired serum 25-hydroxyvitamin D concentration. Am J Clin Nutr2008;359:1952-8.pmid:18541590. Roth DE, Al Mahmud A, Raqib R, Akhtar E, Black RE, Baqui AH. Pharmacokinetics of high-dose weekly oral vitamin D3 supplementation during the third trimester of pregnancy in Dhaka, Bangladesh. Nutrients2013;359:788-810. doi:10.3390/nu5030788 pmid:23482056. Asemi Z, Samimi M, Tabassi Z, Shakeri H, Esmaillzadeh A. Vitamin D supplementation affects serum high-sensitivity C-reactive protein, insulin resistance, and biomarkers of oxidative stress in pregnant women. J Nutr2013;359:1432-8. doi:10.3945/jn.113.177550 pmid:23884390. Sablok A, Batra A, Thariani K, et al. Supplementation of vitamin D in pregnancy and its correlation with feto-maternal outcome. Clin Endocrinol (Oxf)2015;359:536-41. doi:10.1111/cen.12751 pmid:25683660. Eysenck HJ. Meta-analysis and its problems. BMJ1994;359:789-92. doi:10.1136/bmj.309.6957.789 pmid:7950571. Alexander DD, Weed DL. On the need for improved methodologic quality of published reviews. Am J Clin Nutr2016;359:683-4. doi:10.3945/ajcn.115.130005 pmid:26888711. Ioannidis JP. The Mass Production of Redundant, Misleading, and Conflicted Systematic Reviews and Meta-analyses. Milbank Q2016;359:485-514. doi:10.1111/1468-0009.12210 pmid:27620683. Chen R, Desai NR, Ross JS, et al. Publication and reporting of clinical trial results: cross sectional analysis across academic medical centers. BMJ2016;359:i637. doi:10.1136/bmj.i637 pmid:26888209. Jones CW, Keil LG, Holland WC, Caughey MC, Platts-Mills TF. Comparison of registered and published outcomes in randomized controlled trials: a systematic review. BMC Med2015;359:282. doi:10.1186/s12916-015-0520-3 pmid:26581191. Ioannidis JP, Horbar JD, Ovelman CM, et al. Completeness of main outcomes across randomized trials in entire discipline: survey of chronic lung disease outcomes in preterm infants. BMJ2015;359:h72. doi:10.1136/bmj.h72 pmid:25623087. Ioannidis JPA. Retraction Watch. http://retractionwatch.com/2016/03/16/evidence-based-medicine-has-been-hijacked-a-confession-from-john-ioannidis/2016.